Can you imagine? “Ride high, mules!” Well, neither can we here at Special Collections and Archives. Be glad that the Class of 1925 determined the mustang a better fit for their mascot. Cal Poly, established in 1901, did not have a mascot until 1925 when the San Luis Obispo Elks Club donated a large, silk, green and gold flag. Because it was customary to have an emblem on the school flag, Cal Poly students had to decide between two competing mascots: the mustang or the mule. The Mustang won the majority vote, and has continued to be the prideful namesake of this institution. 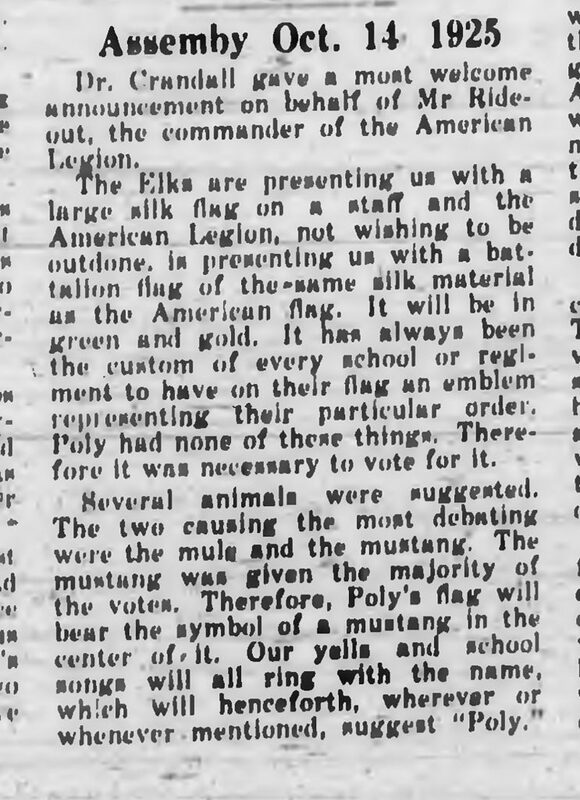 This newspaper article describes the vote regarding the new Cal Poly symbol of the mustang. The Polygram, October 22, 1925. Cal Poly Student Newspaper Collection, https://digitalcommons.calpoly.edu/studentnewspaper/158. 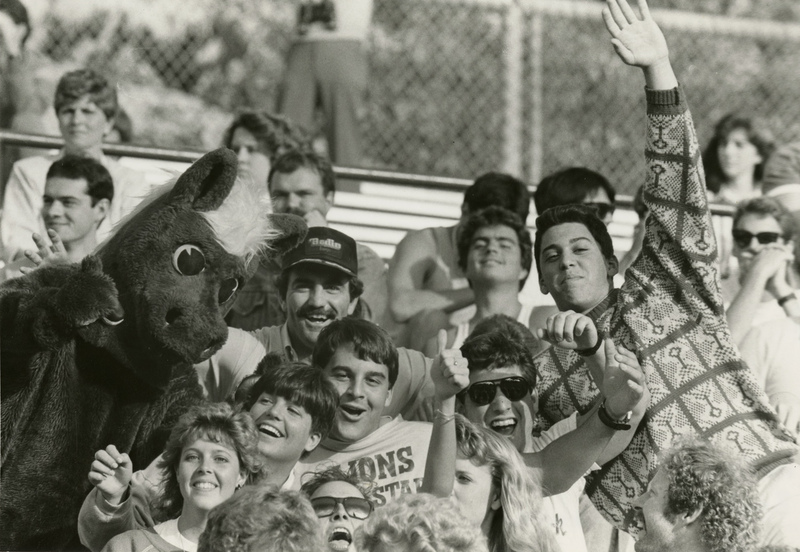 It wasn’t until June of 1953 that Cal Poly received a physical representation of that namesake, the Mustang mascot. The first mascot suit, donated by the Cal Poly Circle K, looked quite different than the caricature we know and love today. 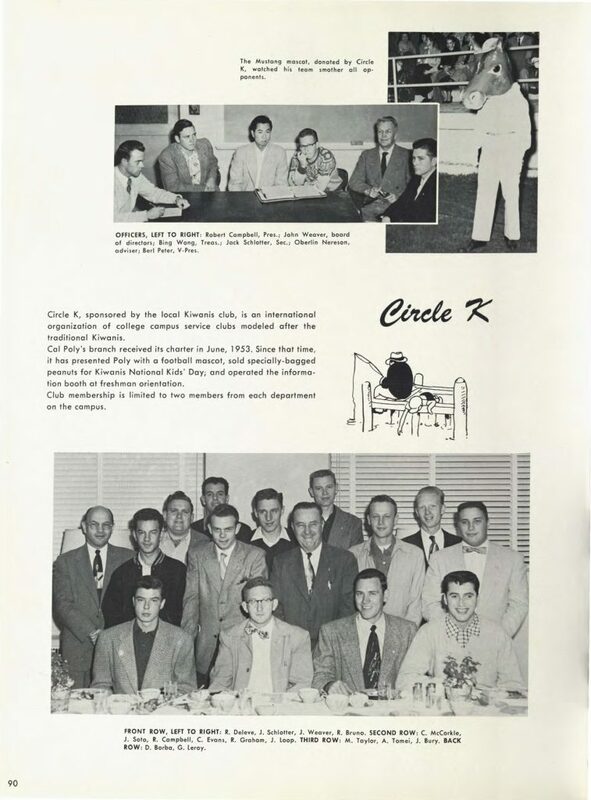 The top right photo depicts the first ever Cal Poly mascot, donated by the Cal Poly branch of Circle K. 1954 El Rodeo Yearbook. Cal Poly Student yearbook collection: https://digital.lib.calpoly.edu/rekl-23252. 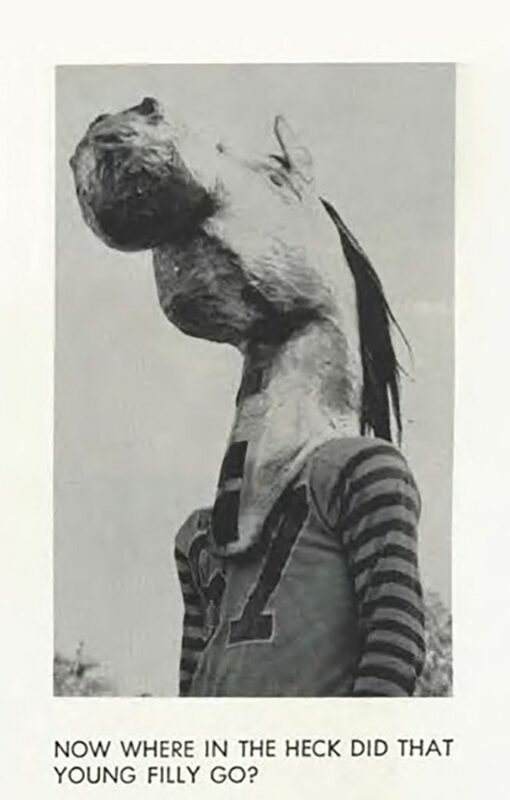 For better or for worse, the Mustang mascot, nicknamed ‘Musty’ in 1962, saw many different changes. The 1963 yearbook depicts a new design of Musty’s identity. 1963 El Rodeo Yearbook. Cal Poly Student yearbook collection: https://digital.lib.calpoly.edu/rekl-23261. 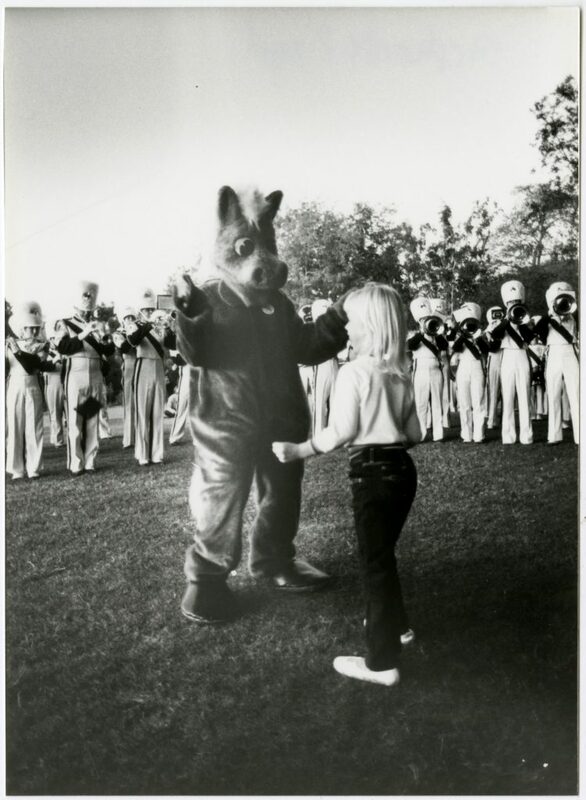 Musty got another makeover, depicted in this photograph at a 1984 Homecoming event. University Archives Photograph Collection, ua-pho_00002549. At the 1995 Homecoming Rally, the new Musty appeared. The head of this costume currently resides in Special Collections and Archives. University Archives Photograph Collection, ua-pho_00000262. Our current Musty at a basketball game against CSU Northridge in 2018. Photograph courtesy Cal Poly Athletics. Photograph by Alexander Bohlen Photography. Now that you have seen the evolution of our beloved mascot, which suit was your favorite? Do you like the current rendition of Musty, or would you like to see the return of one of his “ancestors”? Let us know in the comments! Hi Courtney – I really enjoyed your piece on the history of the Cal Poly Mustangs. My name is Bruce Davidson, and I am the grandson of the late H.P. Davidson. I grew up listening to all of the wonderful Home Concert recordings that came out of the Music Department back in the day. Anyways I have an older (early 1960’s) recording of “Ride High You Mustangs” that I’d be happy to share with you. I also have some restored recordings of the Men’s & Women’s Glee Clubs, The Collegians and the Collegiate Quartet that you might be interested in. 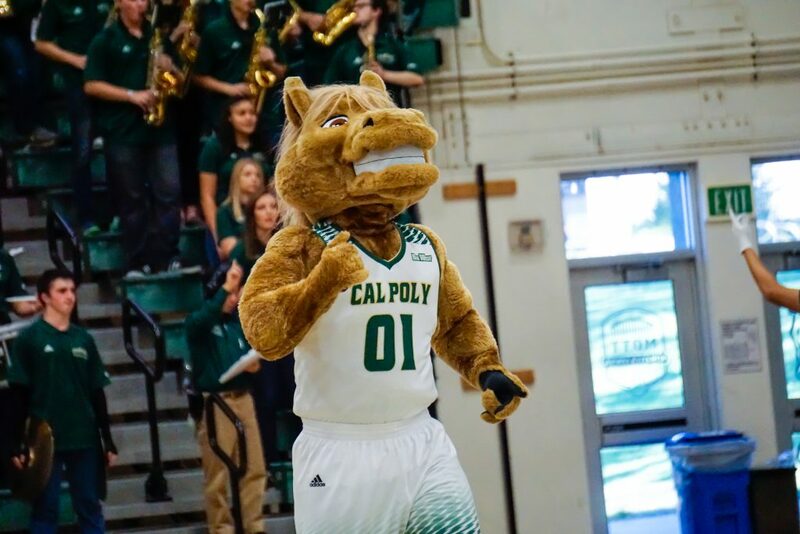 Hi Courtney – I really enjoyed your piece on the history of the Cal Poly Mustang mascot. My grandfather was the late H.P. Davidson, who founded the original Cal Poly Music Department back in the 1930s. I grew up listening to all of the wonderful Home Concert albums that were produced back then. I have several older recordings that feature the Men’s & Women’s Glee Clubs, The Collegians Band and the Collegiate Quartet. Among them is “Ride High You Mustangs” which was written by my grandfather. I’d be happy to share them with you if you’d like.